In early 2012 the LX Club was invited to send two teams to support the Isca Club in their Centenary event. The Tournament Coordinator of the event was Bill Goodridge and he requested a Reds team across the age groups and a club team. Despite having sides at the Barcelona tournament at the same time, the request was honoured and the LX Club added to the success of a key event at one of the countries leading and successful clubs. Hockey was played, at the wonderful new facilities at Exeter University, by boys and girls and men and ladies all ages over an eight hour period over both days of the weekend. Despite the continuing poor Devon weather, not quite summer, strawberries and cream were provided for all, on Saturday and a hog roast on Sunday. The high point of the event off the hockey pitch was the Centenary Dinner held at the popular Langstone Cliff Hotel in Dawlish Warren. A drinks reception on the balcony was followed by an excellent dinner with a fine choice of food. Speakers included other LXer’s, Chris Booker and club President Mike Harris with Simon Mason being the guest speaker. A popular part of the evening was the premier of the DVD of the history of the Isca club made by the ‘Two Toms’. 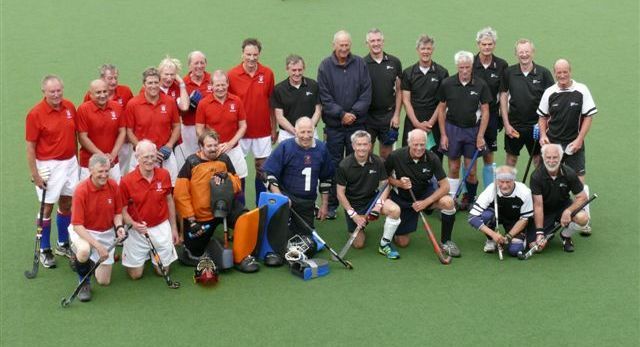 For LX, the eventual high point of the hockey was the Saturday game played against the Isca Senators, the club’s Over 50’s team. As usual, they were a strong and well organised outfit whose policy was to throw everything into attack as soon as the games started. Nevertheless LX absorbed the pressure from a considerably younger team and slowly made their way back into the game with the international experience of ten players in the team contributing to attacks. However, throwing players forward eventually cost the LX Club a goal, as possession was lost just short of the Isca circle. Isca rapidly attacked and out stretched the LX defenders to create a goal that left goalkeeper Best, without too much support. Another break led to the sweeper being drawn out wide to cover an unmarked Isca forward who then skilfully cut inside towards the top of the circle looking for a shot. Best was drawn out 15 yards and saved the shot but the rebound flew to the right winger whose thigh high thunderous shot was saved by Ewing. Further rapid attacks by Isca led to two goals before half time, one of which was a penalty flick. Despite the score line LX were in the game with a strong midfield of Hubert, Jeff and Hutchings who were beginning to link well with Imtiaz, Hopkins and Smith up front, but failing to be incisive with passing and shooting initially. The half time chat by captain Ewing focused on keeping possession and passing more quickly. He stated that the start of the second half was 0-0 and that should contribute to an improvement! The second half started well as LX tended to dominate but a further break by Isca led to a goal to send the score line to 0-4! This was much against the run of play in the second half as LX had improved their passing accuracy and speed which had begun to extend the now tiring Isca team. The tide turned with 20 minutes to go as Hutchings was given more time and space on the circle edge and he scored with a squeezed shot into the roof of the net. A relaxed Isca felt they had a good lead but Imtiaz added to the score line with an excellent shot just inside the post from wide on the right. Smith, yes Smith, added to the score line with a strike high into the goal from the middle of the circle. Isca responded and tried to attack again but good defensive play from Mellor, Stokes, Lucas and Hubert kept them away from Best and Ewing. LX were on top and sealed an outstanding recovery with a penalty flick from Hopkins that trickled under the goalkeeper and just over the goal line. The 4-4 draw in a very competitive game was a good reward and was enjoyed by all of the LX team. LX Team: Best, Ewing, Lucas, Stokes, Mellor, Hutchings, Hubert, Jeff, Hopkins, Imiaz Sheikh, Smith J. With so many players on both sides being fellow LXer’s and/or England team mates and therefore knowing each others games so well, there was always a good chance that the sides would cancel each other out. For a large part of the first half this proved to be the case. Dave Ewing and Mark Watson commanded their respective defences and efficiently snuffed out any break away attacks. The two midfields marshalled by Hubert and Perryman worked hard to establish supremacy but for the most part, honours were shared and Best and Goodridge in the respective goals had little to do. The deadlock was broken shortly before half time when a slick passing move involving a number of LX players was finished off by Phil. Hubert who scored from near the penalty spot. After the restart LX Red gradually exerted more control. Tripp and Sheikh began to see much more of the ball and made frequent inroads against the West defence. Likewise, Mellor and Lucas were able to advance and support the attack. Jeff, Harris and Hutchings worked tirelessly for the cause and Hutchings was rewarded for his efforts with the second goal, a trademark strike from the top of the circle. The West rallied after this setback but John Smith and his fellow defenders held firm. After the game LX continued to enjoy the splendid Isca hospitality, a hog roast consumed to the strains of the Exeter Brass Band. LX Team: Best, Ewing, Lucas, Smith, Mellor, Hutchings, Hubert, Jeff, Hopkins, Imiaz Sheikh, Harris.